Are you missing multiple teeth? If so, you want the most stable and lifelike restorations available. Dr. Coffey and his team are committed to providing top-quality restorative dentistry, including traditional and implant-supported dentures. Both types of restorations will be custom-designed and fabricated to fit securely and improve your appearance. Implant-supported dentures offer a number of additional benefits for your dental function and long-term oral health. Dr. Coffey will evaluate your health and restorative needs. Then together you will select the most appropriate type of dentures. We invite prospective dentures candidates to contact our Chicago practice to schedule a consultation with us. Traditional dentures are removable. They have a plastic base that will fit around your alveolar ridge, the bony area beneath your gums. The plastic base comes in a variety of shades, and Dr. Coffey will select the color that matches your soft tissues. Denture adhesive will keep the restoration in place. There are two types of traditional dentures: full and partial restorations. A full denture will replace all of your teeth. If needed, you can receive an upper and lower restoration at the same time. A partial denture will fill in large gaps in your smile, replacing a significant number of adjacent missing teeth. Small metal clasps will attach to the nearby natural teeth, further stabilizing the restoration. We are proud to offer modern implant-supported dentures. These advanced restorations are permanent, and they offer a degree of stability that is virtually equal to natural teeth. Dr. Coffey works with an esteemed oral surgeon who will place your dental implants. The number of implants you receive will depend on the size of your restoration. 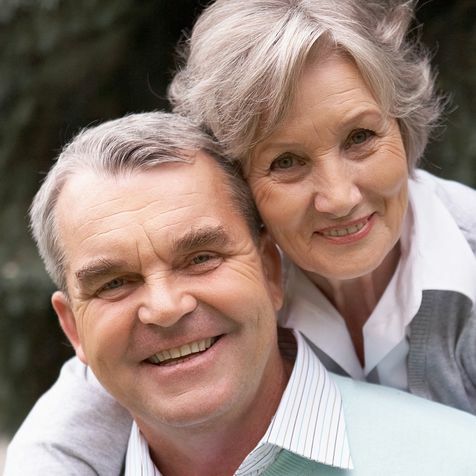 As with traditional dentures, we offer both full and partial restorations. When placing a full implant denture, our partner surgeon often uses the All-on-4® method. He will place four smaller posts at a slight angle. This will provide a firm base for the denture. At the same time, it will minimize the impact to your jawbone. After your gum and bone heal around the posts, we will attach your restoration. It will be custom-made from advanced materials, offering a stunningly lifelike look and fit. When you come to us for restorative treatment, Dr. Coffey will conduct a complete exam. He will take x-rays to examine your jawbone and determine the right type of dentures for you. At the same time, he wants you to be an active participant in your care. He will ask you about your goals and budget so he can help you make an informed decision about your dentures. Traditional dentures may be right for you if you have suffered bone degeneration. This process is a common consequence of tooth loss. Jawbone degeneration can affect your ability to receive implants, since you will not have a stable base for the metal posts. In many cases, your surgeon can enhance your jaw structure with bone grafting. However, if you do not want to undergo multiple procedures, you may prefer traditional dentures. Removable restorations can also be a good choice if you are on a budget. Esthetics is a top concern. Implant-supported dentures are virtually identical to natural teeth. You want to enjoy complete dental function. Implants will never slip out of place, and you will need to make very few adjustments to your diet. You are concerned about convenience. With proper care, implants can last the rest of your life. You want optimal protection for your oral health. Dental implants will stop jawbone recession. This will protect your appearance and help prevent further tooth loss. Find out which type of dentures may be right for you. Contact Dr. Coffey’s office today to schedule your consultation.